I teach for a ministry called PRMI (Presbyterian Reformed Ministries International). I serve as their Missions Faculty for the Americas and have the joy of helping grow their work in Latin America. teach an Ignite course at La Fuente church in Matagalpa. What a joy to see how this investment is making an impact! 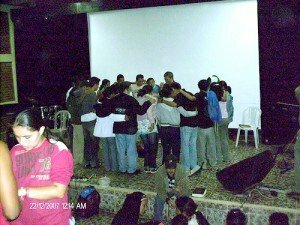 For example, during our evening events with Vida Joven, these leaders helped us in prayer ministry to nearly 250 fellow leaders of Vida Joven, not just from Nicaragua, but from Guatemala and Costa Rica. After a time of sharing the Word of God, these leaders setup prayer stations where individuals could seek prayer in response to the work of God in their heart. We were watching the fruit of our training work in action! We’ve been invited back January 7-18 of 2010 to continue giving our training. In addition to continuing to grow leaders by adding to the foundations we’ve already laid, we’ll add a new church in the capital city of Managua. The reach of this work spreads! Prayer Ignite for the national directors. Spiritual Gift Ignite for La Fuente Church. Ignite is a program expression of PRMI, focused on learning how to cooperate with the Holy Spirit in the work of ministry. Since this is our 6th trip, we will intentionally let the local leadership we’ve been training do much of the work of the ministry and prepare them for teaching in the future. We want to transition from teaching to coaching. We are excited about the Lord’s calling us to this mission! We would like to give you opportunities to be part of our team to disciple these leaders in how to cooperate with the Holy Spirit. Your prayers and financial gifts create the foundation for our team of seven to go. The host church and Vida Joven will take care of in-country travel as well as room and board at the sites of ministry. Our target budget as a team is $6,000 to cover our airfares, translation work and some incidentals. Would you pray about helping? Financial support is needed by December 31, 2009 for our departure on January 7. Thank you for praying, considering, and giving as led! We will be happy to pray for you as you pray for us. And we promise to report back after our trip so you can see how you’ve made a difference. to find out how to mail in a donation, to pray or give online.